History has no record of when Ackergill tower was built, but it is most probable that it was built by the son of John Keith who was inherited the lands of Ackergill in1354 and was the leader of Clan Keith. The first recorded mention of the tower was in 1538 and it has been the source of many troubles between Clan Keith and their rivals, the Gunn family. The tower has seen its fair share of trouble in its life, mostly from the feud between the Keith's and the Gunn's, but it was also attacked and seized by the Sinclairs in the year of 1547. Fortunately for the Keith family the Regent of Scotland at the time, Mary of Guise returned the tower and lands to the Keith's. She also named Laurence Oliphant protector of Ackergill in 1549, but this did not stop the Sinclairs from attacking and once again capturing the tower. Over the next 60 years the tower was taken by various family's in various feuds between them, but was eventually sold legally to the Sinclairs in the year of 1612. They later sold it to the Dunbars who made various additions and heavily renovated the tower. In more modern history the castle was sold to private ownership in 1986 and underwent renovations to turn it into a hotel. 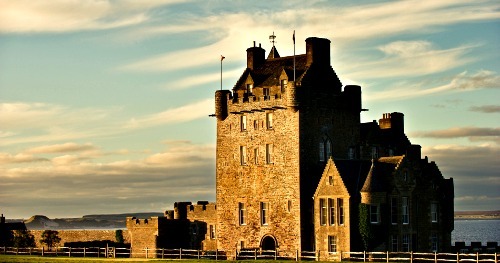 Today the tower is open as luxury hotel and is one of the finest places to stay in Northern Scotland. There are various forms of paranormal activity which occur at the tower and nearby surrounding grounds, but there has only ever been one ghost seen here. She is thought to be the ghost of Helen Gunn, a member of the family who the Keith's were at war with for some time. The Keith's owned the castle and it was their main stronghold in the war against the Gunn's. Both sides committed a number of murders and kidnappings against one another and one of these kidnappings was the abduction of Helen. She was taken by a member of the Keith family and kept captive in one of the upper rooms of the tower. Its not clear if she died trying to escape or was thrown from the room, but she died from falling from the room she was kept captive in. Since that day her apparition has been seen roaming all areas of the tower and an interesting thing about her spirit is that she has been seen with two different appearances. Some people have described seeing her as being made up of a green mist like formation, were others have claimed she has been wearing a long red ball gown with flowing black hair.